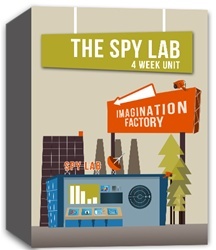 By looking at the evidence, investigating and then debriefing, the Spy Lab becomes a place where kids discover Jesus’ names in a thrilling, fun way, and come to understand not only each name’s meaning but also how it applies to their own lives. By unlocking the clues surrounding the name, kids will have a deeper understanding of who Jesus is, what He came to do and the relationship He offers them. The Spy Lab is a four week unit in the 52 week curriculum series Imagination Factory. In this unit, kids will learn about the names of beginning (names associated with the creation or foretelling Jesus incarnation): The Word, Firstborn, Prophet and Branch. Evidence: Uncovering the name and information about it. Investigation: Examining what God says about the name. Debriefing: Imagining ways to apply the findings of the investigation. As soon as you order, the completed curriculum months will be available for you to download. Just go into your account to find these. As the next months become available, they will be emailed to the address on your account.